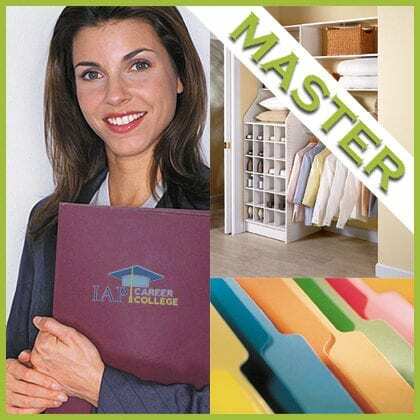 The Master Organizer Certification Course is an advanced organizing certificate course offered online by International Association of Professions Career College (IAP Career College). In this part-time online certification course you will increase your knowledge of organizing techniques. You will then use organizing skills to successfully complete an organizing project of your choice. Throughout the course you will have access to a Faculty Member who can provide you with both educational assistance and career mentoring. As a successful graduate of the Master Organizer Certification Course Online you will receive a certificate recognizing you as a Master Organizer. Please note that this is not an introductory course. 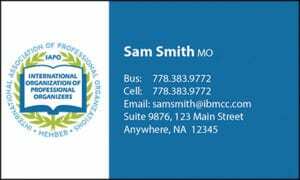 It is intended for people working as organizers including those who have achieved a high level of success in a basic course offered by International Association of Professions Career College. These advanced certificate courses are for outstanding graduates of IAP Career College basic certificate courses. 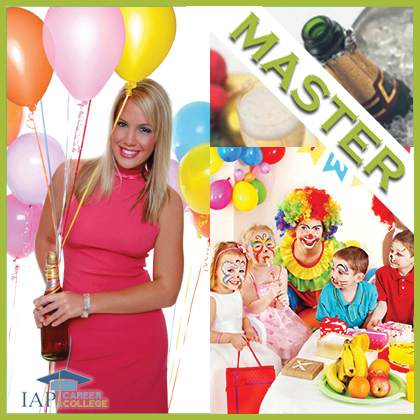 To be accepted into the Master Organizer Certification Course, you should have earned a grade of at least 80% on the final test for a basic course offered by International Association of Professions Career College. Students earning a passing grade of between 60% and 80% on the basic course may be admitted to a Master Organizer course if space is available. If you are an organizer who wishes to enroll in the Master Organizer Certification Course, but you have not yet taken the prerequisite course from IAP Career College, you may take the basic course as a corequisite with (at the same time as) the Master Organizer Certification Course. You can take advantage of this option by registering and paying for the basic course at the same time as you apply for the Master Organizer Certification Course, then earn a passing grade for the basic course. To ensure that the student has personal access to a Faculty Member, only 15 students will be accepted into each Master Organizer Certification Course. The Master Organizer Certification Course is an online learning course with one optional assignment and one required assignment described below in the “ASSIGNMENTS” paragraphs. Students must earn a passing grade to successfully complete the course and receive their Master Organizer certification from IAP Career College. The Master Organizer Certification Course has a recommended completion date of 12 weeks from the starting date or 120 hours. However, you may choose to complete the Master Organizer Certification Course in as little as 4 weeks or as long as 24 weeks, depending on your schedule. Throughout the course you can receive up to four hours of personal teaching assistance or career and business mentorship from a faculty member. That’s up to one half hour per week for 8 weeks with personal attention from a mentor. Although experienced organizers may find it is possible to successfully complete the Master Organizer Certification Course without assistance from a faculty member, it is recommended that you take advantage of this resource to receive maximum value from this certification course. ASSIGNMENTS: There is one optional course assignment and one required course assignment. The optional assignment, which is not evaluated, is a Learning Plan that students may create and discuss with their Faculty Member to assist in developing the student’s organizing skills throughout the course. The required assignment is a Master Project which demonstrates the student’s organizing skills. Evaluated on a pass/fail basis, the Master Project consists of a written paper and, depending on the topic, may be supplemented by other materials such as video, before and after photographs, or client testimonials. Instead of an academic research thesis, students in our Master courses write about an actual organizing project carried out for a client either before or during the 12 weeks of the course. The fee for the Master Organizer Certification Course includes all the following services and benefits for students and graduates. For more information about each of the following, please refer to the FAQ. 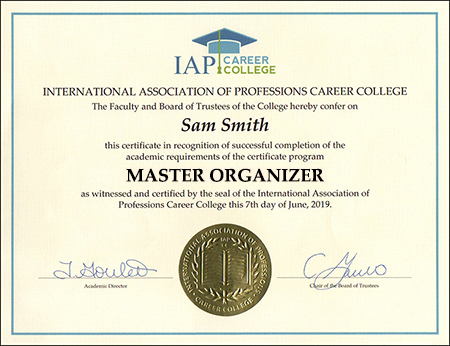 Official Master Organizer certificate with your name printed on fine linen paper and embossed with the gold seal of the International Association of Professions Career College mailed to you which you can show to potential clients or employers. To register for the Master Organizer Certification Course online, click on the REGISTER NOW button. That will take you to a page where you will fill out the registration form and submit your payment. An Academic Advisor will review your student record. 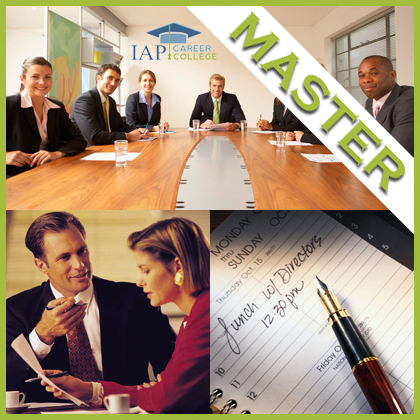 If you received a grade of at least 80% on the basic certificate course offered by IAP Career College, or if you are currently registered in a related course, your registration will be accepted for the Master Organizer Certification course. REGISTRATION FEE: The Master Organizer Certification Course, including all services and benefits, is valued at $797 U.S. As this is a new program, the course is currently being offered for a reduced fee depending on your starting date. For 2019, the course is scheduled to be offered once per semester. The registration fee for the April 2019 course is $377. This fee may be tax deductible as a business expense and is fully refundable if your application is not accepted for any reason.